In a medium mixing bowl, sift together flour, cocoa, baking soda, baking powder and salt. In a large bowl, using a mixer on medium speed, beat together butter and sugar until creamy - about 1-2 minutes. Beat in vanilla and egg until combined - about 1 minute. Beat in melted chocolate until combined. Reduce mixer speed to low and gradually beat in flour mixture until combined. Stir in macadamia nuts and white chocolate chips until well incorporated. Take heaping tablespoons of dough, roll into balls, and place on cookie sheets, spacing about an inch apart. Bake for 9-10 minutes or until set, and cookies look crinkly. Transfer to wire racks to cool. 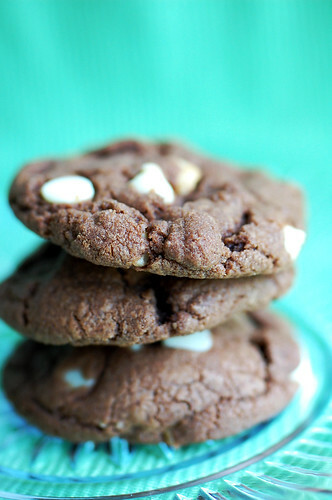 28 comments on "Chocolate White Chocolate Chip Macadamia Cookies"
I am sure your mom will love the grasshopper pie espicially since it is made from the heart. That is what we mom's love best. Happy Mothers Day to all the special women in your life Emily. What a sweet tribute to your mom - hope you all enjoyed the pie :) And I'd like a cookie please, they sound fantastic. Happy mother's day! Those are GORGEOUS photos - I could eat them all. Delicious! 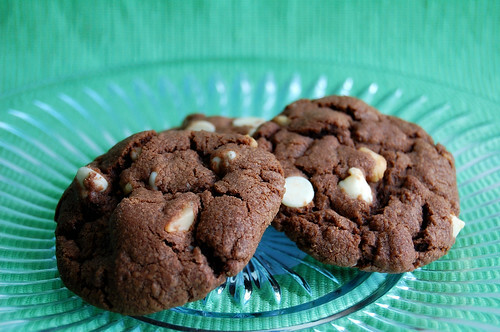 I love macadamia nuts in cookies. OMG yourpictures are amazing. the cookies are coming out of the screen!yummy! you always make the perfect cookies. I love macadamia and chocolate chip cookies! I've never eaten grasshopper pie, buy I think I'd like it. I have, however, eaten these cookies and I totally give them two thumbs up! Can't wait to make them myself. Got my macadamia nuts this weekend. I also was thinking about using a dark cocoa in them. Grasshopper pie! I've been wanting to make one forever but nobody I know in France actually likes the chocolate mint combo besides me. Your cookies look scrumptious! Your Pie was the best part of my Mother's Day. Thank you. I love you very much. Love these cookies. Macadamia nuts are the best and who can say no to chocolate. So sweet! That's just another thing to love about you - that you put your all into your baking! Tiger also had a neck injury this weekend doing what he loves. I'M TALKING ABOUT GOLF! Your mom is lucky to have you and vice versa, of course! MMM Grasshopper pie sounds good! Your mom is a sweet lady. I'm sure she loved her pie and the sacrifice you made for it. Can I be your mom? I want you to make me those cookies! You made me remember how a grasshopper was the first adult cocktail I ever had. It was good. So glad your mother is OK, Emily! And I know they loved your grasshopped pie, even if you think it needs more work. (you are a perfectionist!) Can't wait to see your recipe. 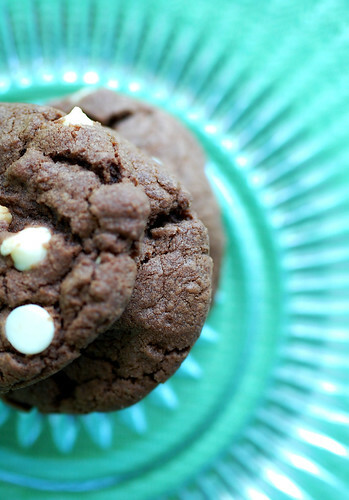 But for now, I'll make do with these heavenly chocolate cookies! I love chocolate, white chocolate, and macademia nuts. The combination of the three would be orgasmic... uh, taste-wise of course. Oh! And I finally updated my blog. I hope you are working on that pie again. I am VERY eager to get my hand on your recipe! You're the best! ooohhh... they look so delicious. I'll have to give them a try. Thanks for the recipe! Oooooh tehese cookies look so special & ooh so tasty, dear Emily! I am also curious about that special pie! I hope that your mother had a great Mothers day! Hi Rachel, I love you too! I need to email you. I'm glad you liked it. I have a better recipe now though. I think I'd like that cocktail very much. These look divine and great! Anything chocolate is great in my book! I bet these would taste great with some mint in them as well.